SUQQU is coming out with more and more beautiful new eyeshadow quads with mixtures mattes and shimmer textures, some quads all exclusive to UK, but I have yet to review and post swatches of all the existing (new) quads. I haven't had the heart to depot any of newer generation of SUQQU quads, but in the case you're interested in seeing my older SUQQU eyeshadows I'll gladly post my humble collection. Today I'll share with you Yuushakuyaku 01 (優芍薬), the most neutral of the new Designing Color Eyes line. I was PR gifted this palette during the initial launch, but my views remain my own! Like all (new) SUQQU palettes, Designing Color Eyes comes with two dual-ended eyeshadow applicators: one with sponge nibs and one with brush ends. According to the SUQQU official website the colors are read from left to right, up to down: highlight color, nuance color, accent color and deep color. Word "SUQQU" is sort of an overspray on the darkest shade and dusts away after the first use. Despite Yuushakuyaku's shades being quite tonal, neutral and complimenting each other, the nuances in undertones keep this quad interesting in my opinion. The beauty of SUQQU's signature shimmers and color combinations are very prominent: All shades look excellent layered, you need little to no work to combine these colors. If you are a die-hard fan of mattes or more complex glitters, this might not be the palette for you as it lacks a matte and the choice of shades is on the tonal side, but personally I find this quad very easy and enjoyable to work with. The quality of powders are excellent, all of them perform very smoothly, they're pigmented and effortless to blend. No chalkiness in sight. Soft Japanese eyeshadows don't usually last more than 8 hours on my hooded lids without an eyeshadow primer, but all shimmer fallout was minimal. Personally, I find Yuushakuyaku 01 is a must-have neutral palette in anyone's collection. Similarly I love Burberry's Mocha quad and Rouge Bunny Rouge's Antigo (review here) for more of a satin -look. Yuushakuyaku has some shimmer, but is still easy-to-reach, effortless to use and beautiful for any occasion. I especially like the Japanese-style gradient eye done with these shades. Although I have a soft spot in my heart for the older SUQQU palettes, I do enjoy the pigmentation and smoothness in Designing Color Eyes quads. 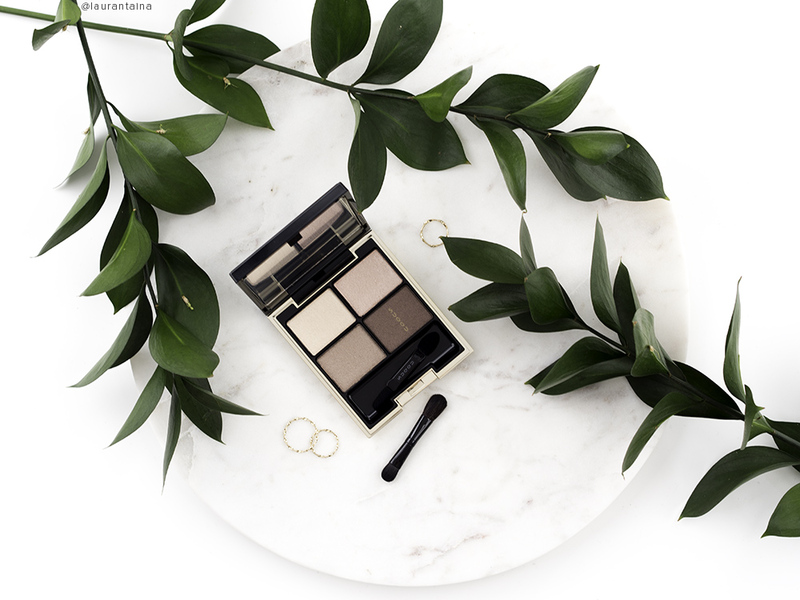 Lately I haven't seen the new palettes online on Selfridges.com, so meanwhile you can try try contacting SUQQU via email (suqqu.london@eqpuk.com) to order or call Selfridges London at +44 (0)207 318 3956. This post contains products that were generously provided for consideration. Regardless, my opinions are my own honest and unbiased views. The links are for your convenience and do not contain ads.